Old and New Testament with St. Jerome’s prologues and the Interpretation of Hebrew Names. The present Bible manuscript was undoubtedly written in Paris, where the production of these small format Bibles flourished. 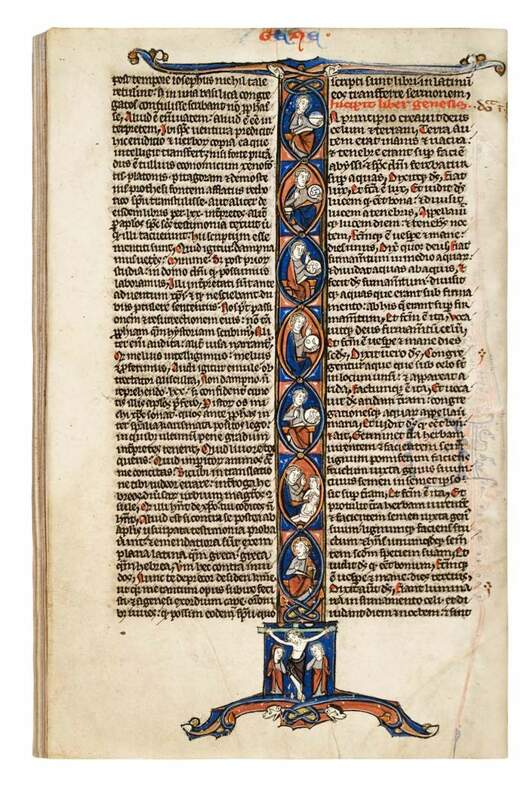 In the 13th century, clerics in Paris required a Bible volume compact enough to take along on their travels. Scribes then made smaller and smaller manuscripts comprising the complete set of Scriptures in a codex no larger than what a hand could hold. Using extremely thin parchment and an extraordinarily tiny script, the Bible became highly 'portable'. Making such small books required good planning and organization. The spaces designated for decoration had to be allotted beforehand and illuminators had to adapt their painting accordingly. Here, all books and chapters are introduced by puzzle- and flourish-initials; moreover, eleven books open with a historiated initial, two of which – as often in these small bibles – are larger and extend along the text column. The Old Testament opens with Creation at Genesis (f. 4v), and the New Testament with the Tree of Jesse (f. 468) at the Gospels of Matthew. Within a form of seven joint ovals, the days of Creation are represented, illustrating the foundation of heaven and earth, the firmament, land and trees, sun and moon, animals, Adam and Eve, and, at last, God's rest. While the Creation accomplished the work of man's formation, this perfect world was followed by man's fall. The series culminates in a scene of the Crucifixion, the sacrifice securing man's salvation. The 'small in size but large in scale' illuminations are by an artist of the so-called Mathurin workshop, who used firm, black outlines to achieve simple but clear figures, uncomplicated draperies, and sketchily drawn, transparent heads.